This very powerful but simple breathing meditation technique has at its core a mantra, which we constantly emit just by breathing – it is like the natural sound of our breath. During inhalation we emit, mostly unconsciously, the syllable “HAM” and during exhalation the syllable “SA”. HAMSA or SO´HAM is an ajapa mantra (a non-uttered mantra). 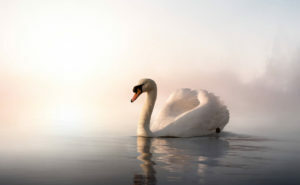 In the form HAMSA (swan, in Sanskrit), it signifies pure life and awareness (symbolized by the white, immaculate swan, floating over the waters), and in the form SO’HAM means “I am (aham)[essentially, one with Him (sah) – i.e., God]” or in other words “I am the pure, unchanging, immutable godly Subject [of everything]”. Sit down in a meditation posture with the back straight. Relax your body and mind. When you feel centered in yourself, start with an inhalation and simultaneously mentally emit the mantra “HAM” consciously. Then, during exhalation, mentally emit the mantra “SAH”. You can also choose the other version and emit “SO” while inhaling and “HAM” while exhaling. Repeat the inner mantra emissions with every breath. Let your breath circulate completely naturally. It is not important, if you breathe deeply or superficially, if you breathe in the belly or in the chest or how slowly or fast your breath goes. All these conditions might change during the technique – just let it be and emit the two mantras according to the natural flow of your breath. While emitting the Mantra, focus on the flow of prana (essential energy), which is moving between the two essential centers of your being: your spiritual Heart (a subtle space approximately in the middle of our chest) and dvadashanta (12 fingers width above our head). During the inhalation prana is moved in your heart-space. Here your breath naturally stops for a moment. Then during exhalation prana is ascending through the subtle median channel (sushumna nadi) from your heart to dvadashanta (12 fingers width above your head).Reaching here, your breath stops again naturally. Pay special attention to these two moments of stillness and void during the flow of prana in your breathing cycle. As the technique unfolds its effects, your breath can become very slow and shallow or even stop completely (sahaja kumbhaka)?. At this moment, the two points in your being will merge and become one and you realize that there is no separation between the inner and the outer world, between “I” and “non-I”, between your Heart and the Heart of God. This traditional ancient yogi breathing meditation technique purifies us from attachments and calms the mind until its fluctuations stop. The hereby obtained state of yoga can lead to the awakening of Kundalini Shakti (the immense godly spiritual power dwelling within every human being in a potential state) and the revelation of our True Immortal Self – Atman. Practiced in the moments of solstices or equinoxes (or at sunrise, midday, sunset and midnight etc.) it aligns and harmonizes gradually our inner time cycles with the cosmic time cycles.